Best sugar glider toys are very important for your new pet. They are very active animals who love to move around their cage and play with their toys. This toys allow them to practice chewing, tossing, pushing, climbing, running, and carrying objects. All of these play activities give your pets a chance to develop and improve mental health, physical health, improve dexterity, and coordination. This is the reason why it is necessary to have toys and branches in the cage while this pets are still babies to foster their development and allow them to grow into independent, confident, healthy, and happy playful pets. A list of the toys that you can purchase to start them off with play are ropes, wheels, swings, bells, branches, balls, cardboard boxes, old socks, old shirts, etc. Also, this pets love ropes. They can climb them, swing from them and run around them. If you want to attach a rope inside your sugar gliders cage, make sure that they are 100 percent natural fiber ropes like cotton, hemp, or sisal. Tough nylon blend ropes are not recommended. The tough material can cause injury and cuts if the pet get caught in them. Frayed natural fiber ropes can be dangerous. To prevent fraying, make sure the sugar gliders nails are always trimmed. If the ropes do fray replace them. Branches are a great addition to sugar glider toys inside the cage for pets to climb on, swing from, and chew on. Make sure that the branches are live green branches and not dried out or preserved branches. Any wood or branch that has insecticides or chemical wood treatments on them should not be put inside the cage for this pets. They are toxic and dangerous for the animals. In the wild, this pets love munching on eucalyptus branches. If you can get fresh, green branches of eucalyptus, they will consider it a treat. There are safe and unsafe woods for sugar gliders. Some of the types of wood that are safe to put the cage are Pine, Birch, Balsa, Basswood, Walnut, Poplar, Maple, Elm, Apple, ash Cactus, and Manzanita. The unsafe wood types that you should not put inside your pets cage are Cedar, Red Cherry, Plywood, and Oak. Also never give your sugar gliders food like onion, garlic, lima beans, chocolate, rhubarb. If you like making wooden toys for your sugar gliders, make sure that you don’t soak them in soap water when cleaning them. If you do, make sure that they have been completely dried before putting them back into the cage. Wet or moist toys can form bacteria that will be harmful to your pets. This is why plastics or acrylic toys are the best kinds of toys to give to the animals. They are very durable, and they come in very colorful colors that are visually stimulating to them. There are so many designs and types of acrylic toys that can be found in pet shops, your local breeder’s shop and online. Make sure that the toys you buy don’t have parts that can be chewed off, or sharp edges, or pointy surfaces that may cause your pets to choke on or hurt them in any way. Safety should be the consideration when purchasing acrylic or wooden toys for your little pets. Other popular toys that this pets love are rings, bells and balls. When buying ring toys make sure that they are wide rings that sugar gliders can fit into and not get stuck in. A type of ball that pets can play with is the hamster ball. They can go inside, run and move around with the ball as it rolls around the cage. Very active physical exercises sugar gliders love, as it develops their muscles, makes them stronger and keeps them in a very happy disposition. Bells: These animals are a noisy bunch and they appreciate toys that make a lot of noise. When purchasing bells, make sure that the clappers are firmly attached. If not, and your sugar glider removes them or chews on them, this may cause injuries. Another thing about bells, test if they are made of lead, if you push on the clapper and it makes a dent, it is lead. Do not buy it. It can poison your pet. The jingle type bells are not recommended because this pets can get caught in their narrow to wide openings and cause them to be injured. The cow bell and liberty bells are the better designs to choose. 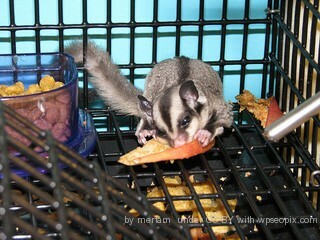 This pets will almost always like most sugar glider toys that you give them to play with. Make sure that when you buy toys, the safety of the pets is the first consideration. You can buy a good number of toys in different shapes, color, material, or play use. Just have them rotated in the cage so that your pets always have something new to play with which keep them from getting bored. Observing which toys your sugar gliders prefer will give you an idea on how to keep them active, interested and healthy.